Over the years, I have had the privilege to visit and accompany Caritas and other Catholic Church-inspired organisations in Africa as they responded to the epidemic of HIV and AIDS. I always received warm greetings and handshakes, even when people were traumatised by the massive loss of life that resulted from AIDS. On my recent visit to Liberia, however, I found a 'different Africa.' From the moment that our plane touched down at the Monrovia airport, we were confronted with buckets of bleach water with which to wash our hands and people armed with 'gun thermometers' to take our temperatures. The Ebola situation in the country is grave and continues to disrupt everyday life for most of the population. Many hospitals and clinics are closed, so it is very difficult to get medical treatment for other diseases. Some people die in the streets looking for medical treatment for infection or for a whole host of other diseases. Schools and many government offices are closed. But also the socio-economic impact is very dire in a country that just emerged from years of conflict and now must deal with the 'war' on Ebola. In the communities in which quarantine has been imposed, people do not have access to food, clean water, and other necessities. There is a general sense of psychological trauma and anger among the people; several people shared with me their fear that social unrest and conflicts will soon begin again. So what can the international community do? The Australian government funding to Australian NGOs including Caritas Australia is helping to fight the Ebola outbreak across West Africa is helping. For the Caritas network in Sierra Leone, the funding is being used to assist 230,000 people at risk of Ebola, through the provision of medical supplies, essential public health support and the training of health workers in the West African nation. But more international funding is desperately needed. Ebola outbreaks have remained more or less limited to areas in Africa that do not receive a large number of foreign visitors, and those who do come are not usually in close contact with people who have symptoms of Ebola. We must remember that transmission occurs only when the body fluids of an infected person have a port of entry into the body of the previously uninfected person. On the other hand, those caring for persons sick with Ebola are at greatest risk of infection, particularly when they do not use protection equipment such as masks, goggles, gloves, gowns and boots. In Liberia, the crisis has brought the health care infrastructure to breaking point. The Catholic Hospital of St Joseph, in Monrovia, was considered one of the best health facilities in the country, but it was closed after the director and eight other staff members died of Ebola. Recently I walked the halls of the closed hospital together with one of the surgeons there that became infected with the virus but who has now recovered. He sadly showed me the rooms where his colleagues, including Br Patrick Nshamdze, director of the hospital, received care before they were admitted to the Ebola Treatment Centre where they died. Not only these the medical missionaries, but also the local staff with whom they worked, gave their lives because they were committed to the medical oath of serving all sick people and of upholding the dignity of the human person from conception to natural death. For them the practice of medicine was not a 'business'; it was a vocation. 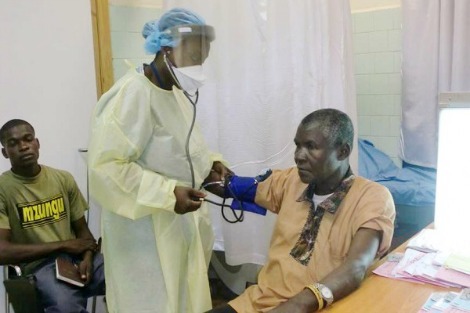 The Brothers of St John of God are in the process of re-opening the hospital but they need financial help to do so – they also will need to organise an Ebola screening unit. They want to walk in the footsteps of their brothers and sisters in religious life in the Catholic Hospital of Saint Joseph, in Monrovia, who walked before them in service to the sick in Liberia, but they need the help of the international community. In a similar way, the efforts of Caritas Liberia to expand education and social mobilisation and support efforts to all three dioceses in the country will play a crucial role in preventing the further spread of the virus, of helping those already infected and affected, and in reducing irrational fear, stigma, and discrimination in local communities. Monsignor Robert Vitillo is Caritas Internationalis’ UN Delegation head and Special Advisor on Health and HIV. Donate online to Caritas Australia's Africa Emergency Appeal. Image credit: Caritas Internationalis - St. Joseph Catholic Hospital de Monrovia (Liberia) in July before it was closed.